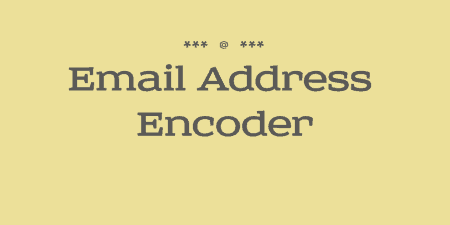 Email Encoder Bundle is a helpful plugin for WordPress with the main task of hiding email address from spambots. Building an email list from scratch is a part of every business. It requires time and patience to be completed and to serve the purpose. Email harvesting has evolved out of the need to take a shortcut and collect already existing email lists. Although it attracts a lot of starters, it is illegal in many countries, and it can seriously affect the business. A loyal base of customers cannot be built in this way. 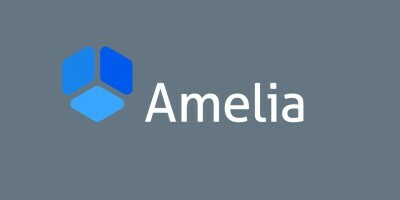 Scraping of emails carries a lot of risks, one of which is ruining of yours or the reputation of your brand and putting your business on the blacklist. Consequently, you can be out of business in a short period of time. Many other risks include suspension by SMTP service and the penalties prescribed by the laws of each country. Creating a solid and loyal base of customers is the only way you should act, and once you have accomplished it, you will see that the result is worth your time and effort. It is up to you then to protect the email marketing list from the others who might violate it. Protection from harvesters is a must for every WordPress website with a publicly visible email address. Every website owner has been exposed to spammers. Denying access to an email address to readers and visitors of your website is not an option since there are several ways to protect it. Substitute or disguising the email address is a simple but not a permanent solution when the issue becomes too much of a problem. Other possibilities comprise encoding characters in an email address and use of images instead of plain text email. All mentioned methods require some extra time and engagement, but if you think of doing this work automatically in all posts and pages, you better throw attention to Email Encoder Bundle – a specialized plugin which will help you avoid the spambots. What is the Email Encoder Bundle? The Email Encoder Bundle is an easy-to-use plugin providing automatic protection of all mailto links while template functions or shortcode protect phone numbers, plain email addresses or any other text that needs to be hidden from harvesters. The important feature is the support of special characters many languages have. RSS feeds have also been protected, and ease of use enables you to customize everything at your will, for example, to use action and filter hooks, shortcodes, and template functions. You can manually create encoded scripts by using the Encoder Form. The installation of the Email Encoder Bundle starts in the plugins directory of the Admin menu and comprises a few simple steps. Click on the Add new button, search for the plugin and click on Install Now or you can choose to upload email-encode-bundle.zip. The last click is related to the activation of the plugin. After that, all mailto links get protected automatically. In case of need, you can rely on the Help tab on the plugin options page which offers all kind of support. 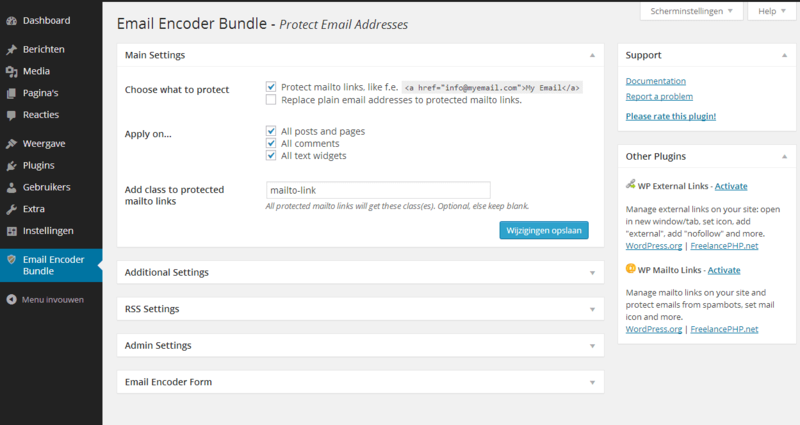 Main settings of the Email Encoder Bundle offers you to choose what to protect and to apply protection to all posts and pages, comments and text widgets. Additionally, RSS, and admin settings, as well as Email Encoder Form can be customized manually. After you have set up the settings, you can test if an email address or some other content is encoded. The plugin option in the Admin panel ‘Show ‘successfully encoded’ text for all encoded content, only when logged in as admin user’ shows a conforming notification on the right side. You can also do the check-up manually by right-clicking on the page and selecting the Page Source Code. The text may vary on the browser. The real source code shows up without providing a readable email address. 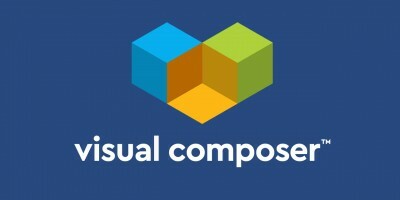 The Element Inspector of the browser shows a real-time representation of the page or post with the decoded email address which is usable for the page visitors. Mailto links will be encoded automatically while you can use the shortcode in your posts. There is no change for visitors, but the spambots will be prevented from accessing the encoded source behind. The unreadable code completely protects your email address. Phone numbers or other content are to be encoded using the shortcode within the posts while the template function works for other parts of the website. If the option All text widgets was activated in the main settings, it limits filtering for encoding only to text widgets. 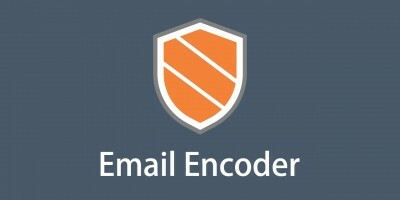 Email Encoder Bundle is an open source, user-friendly software that minimizes the risks of becoming a victim of spammers. In this way, it protects your business, enhances the reputation of your brand, and guarantees communication with readers and users without any unpleasant issues. Email encoding is easy with Email Encoder Bundle plugin, and it enables you to show email addresses on posts and pages without risks of getting unwanted messages. For the users, a single click on the email address is a more convenient way for communication than to fill the contact form. Users can also copy the address to their mail window, so you don’t have to worry about the usability. The plugin tests for the compatibility with the latest releases of WordPress are being conducted by highly skilled professionals. The technical support is equipped with a variety of resources to fix all kinds of possible issues and is available for immediate response. In this easiest way to escape from spammers, you are covered to proceed with the building of your marketing mailing lists and other contacts without the risk.